I’m referring, of course, to the films of Jordan Belson. Photographing percolating jam is actually rather difficult: the lens fogs immediately and there’s the risk of stabbing little splashes of hot bubbling preserves. 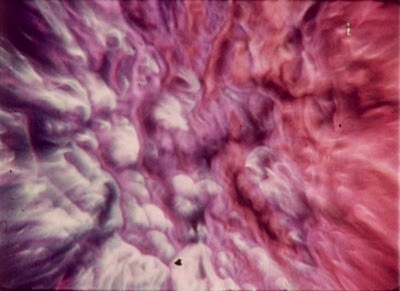 Achieving Samadhi, the title of Jordan Belsen’s abstract colour film from 1967 is of course, much tougher, as is the act of describing it by the uninitiated without gross copyright infringement. Essentially its a non-dualistic state of consciousness reached through advanced yogic practice. In making the jam I broke Petunia’s rule of triangulation. 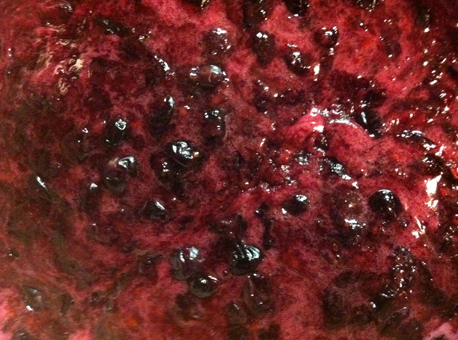 I used 4 ingredients in addition to sugar: blueberries, lime juice, tequila, and flakes of red pepper. During the cooking process W. commented that the mix smelled like old socks. I believe this was due to some sort of condensing action of the lime juice and the tequila. Or perhaps it was something to do with the neighbors. Gratifyingly the jam does not taste like Limburger (however you also can’t really taste the red pepper flakes; I thought of adding Sriracha sauce but restrained myself. Genius may have been snipped in the bud). I also thought of adding bits of bacon, which lead me on a reverie linking Paula Deen, jam making, bacon, speck, class-based cultural critique, and late-stage-capitalist just-in-time breakfasting (all the ingredients in-one for greater expediency). I was thinking about bacon and Belson because I’m helping to curate a show and this weekend we looked at alot of proposed pieces (one of which made me think of bacon and another Belson; no jam though). Some really great work, but sadly we had to send out rejection notices because there just isn’t room for it all. I’d never sent a note rejecting someone’s art before and I came finally to understand the saying “this is going to hurt me more than you” (about spankings). Ultimately it doesn’t hurt more: its the difference between a splash of liquid and enlightenment, but its interesting to see things from the other side. For more information about Jordan Belson see the Center for Visual Music’s website. A DVD of a selection of his films may be ordered from them: Jordan Belson – 5 Essential Films. The image at right is a still from Samahdi; its actually rather different from some of his other films. It also looks a bit like cotton candy.